UPDATE: Gran Turismo 5 for PS3 in 3D on sale today | What Hi-Fi? After a long, long wait Gran Turismo 5 for the PS3 finally goes on sale in the UK today. To celebrate the launch, Sony Computer Entertainment is running a GT5 3D gaming tournament across the country. 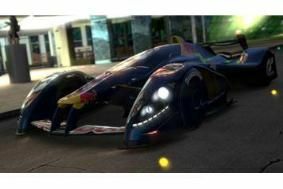 A raft of Sony Bravia 3D TVs are being installed in HMV stores across the UK to see racers battle it out to be crowned the UK's ultimate 3D GT5 champion. The heats will run on a leaderboard system form Saturday, November 27th for ten days. The fastest two players from each region will win a place in the grand final, which will take place at HMV Oxford Circus in London on December 15th. The contest will be compared by Formula One personality Jake Humphreys. GT5 costs £50 or £60 for the collector's edition, and is also available as a £290 PS3 console bundle (320GB). Feeling the pinch? You'll find it for as little as £35 if you shop around. We've seen previews, 3D demos and been tempted by gorgeous-looking graphics, and now finally we have a UK release date for Gran Turismo 5 on the PS3. It will arrive in UK stores on November 24th, according to developer Polyphony Digital, part of Sony Computer Entertainment. Fans will be able to choose from dozens of circuits, including the Top Gear test track as seen on TV. The game will be 3D compatible too. More than 1000 cars will feature in the game, including the Lamborghini Murciélago LP 670-4 SuperVeloce, the Lexus LFA and the McLaren MP4-12C. Gran Turismo is the world's most popular video racing game series, having sold more than 56 million units worldwide. But the latest version has suffered from serious delays, originally being scheduled for release last year.